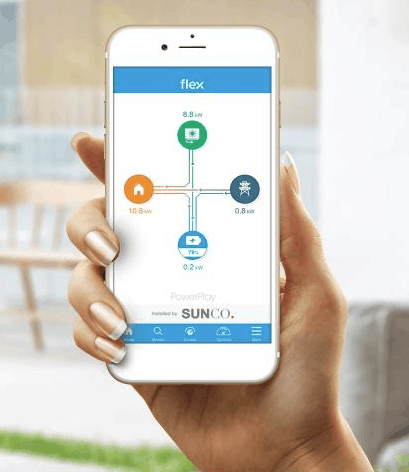 A company named Flex (also known as Flextronics) have rolled out the Flex PowerPlay ‘smart solar power system’ which consists of various combinations of Flex branded solar panels, an inverter, an energy hub, and an energy monitor. It’s compatible with many existing solar battery brands and is being offered through Energy Matters in Australia. Flex are a well established company who have made the move into residential solar, offering ‘smart solar’ which will help you ‘outsmart the system’ – it’s like a vertically integrated, polished version of the Paladin Solar Controller. According to their website more than 20,000 Australian homes and businesses are currently using Flex – and they have delivered over 8 million solar panel modules to customers worldwide. The PowerPlay solar power system uses their own 60cell, PID-free Flex PowerPlay panels which are available in 290w and 295w, with a 12 year product warranty and a 25 year performance warranty. According to Solar Quotes their efficiencies are 17.8% and 18.1%, respectively. The Flex inverter will divert power depending on time of day, current tariff, current energy storage, and much more – in order to save you as much money as possible on your power bill. You’re able to use the app to see exactly what’s happening with your system at any time. Flex (NASDAQ: FLEX) are a massive engineering company who are also leaders in battery tech – they’re responsible for 1 in 4 smart meters in the US, 10 million micro inverters, and have worked with Google, Nike, and Fitbit to deliver tech solutions. The company represents more than 200,000 professionals in over 100 locations around the world. Their quarterly rev for Q3 2018 was USD $6.75 billion – increased 10% YOY. Their offices in Australia are located in Sydney and Melbourne – so they’re far from a fly-by-night company and buying from Flex is a safe bet. As discussed before, you’re also able to use existing solutions from brands such as sonnen, whose solar battery storage solutions (e.g. sonnenBatterie Eco 8) are also well established and have fantastic reviews. Interested in Flex’s offering? If you’re in Australia you can check your eligibility and request an obligation-free quote by clicking here. ← Solar Power in Vietnam grows rapidly.